AirPhil Express Fly FREE ~ Philippine Freebies, Promos, Contests and MORE! Grab your chance for another great adventure inside or outside the country! 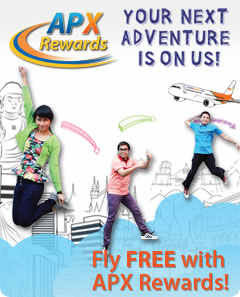 AirPhil Express has a Fly FREE program in which you just have to collect 10 international and domestic boarding passes (passenger's copy) in exchange for FREE one way ticket. Here's how it goes. After completing your passes, present your used AirPhil Express tickets to any APX business hubs. You may exchange one (1) international boarding pass for two (2) domestic boarding passes and vice versa but only one pass exchange is allowed per redemption. APX will issue a GC/travel voucher which you will give to any AirPhil Express-owned ticket office in swap for a flight ticket. Ten (10) domestic boarding passess entitles you to one (1) FREE domestic ticket. Likewise, ten (10) international boarding passess entitles you to one (1) FREE international ticket.